Hereditary Grand Duke Guillaume and Hereditary Grand Duchess Stéphanie are still on a mission - a trade mission, that is. The duo, Deputy Prime Minister and Minister of the Economy, Etienne Schneider, and their accompanying delegation travelled to Beijing on the evening of the previous day - it's a bit confusing this (meaning the one in Beijing) is day 3 for Guillaume and Stéphanie while Minister Schneider is already on his fifth day in China. And then, May 6, they had a busy day in the Chinese capital. The Luxembourgish delegation attended an economic seminar and a seminar to promote Luxembourg as a tourist destination. 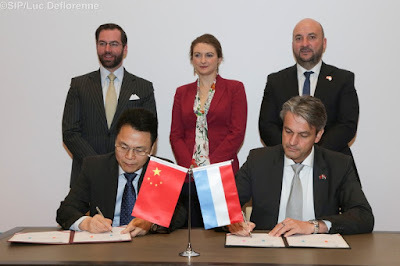 At the seminar entitled "Luxembourg: Your Innovation Centre in Europe", two cooperation agreements were signed between the Luxembourg Chamber of Commerce and the China Council for the Promotion of International Trade. They also had lunch with the Vice-President of China Aerospace Science and Industry Corporation (CASIC). The day in Beijing and the trade mission was concluded by a reception hosted to celebrate 10 year anniversary of IEE, a Luxembourgish sensing systems manufacturer, in China. The government website has more information as well as pictures.